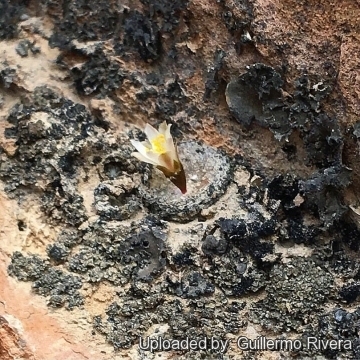 Origin and Habitat: Blossfeldia liliputana is established over a wide geographical area ranging from Southern Bolivia (Potosí Department) to north-western Argentina (Jujuy, Salta, la Rioja, Mendoza, San Juan and Catamarca Provinces). Altitude: 1100 to 2500(-3600?) metres above sea level. The species grows in patches and is not frequent, but is locally very abundant. Habitat: The species grows in monte, chaco and prepuna. Plants are found growing in sunny dry places between boulders on rocky slopes and often between cracks near the rivers in the sides of vertical stone cliffs with a little fine soil mainly on shale like rock formations often close to waterfalls where they have a almost continuous water flow running over them, but can withstand severe drying out and (in habitat) they can survive to nearly complete desiccation, recovering when fog, mist or rain returns to their natural environment. Their colour and shape is hardly distinguishable from a stone and are not significantly threatened by human influences. However the species is sought after by collectors, whenever a new population is discovered it is rapidly depleted. Trade is mainly national but international trade exists too. 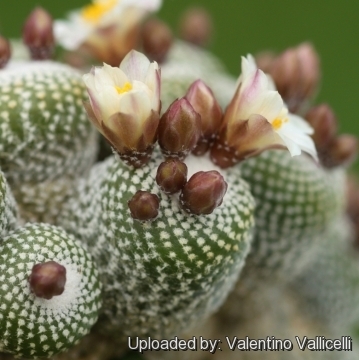 Description: Blossfeldia liliputana, is a solitary or clumping miniature cactus, with no rib and no spines. The smallest of all cacti and one of the most priced by impassioned, but rarely seen on its own roots in cultivation for any length of time. Although several species of Blossfeldia with minimal differences have been described (as many as six), most botanist agree on the fact that all the ones described until now should all be included in the Blossfeldia liliputana. Habit: It is an highly specialized specialized species with a unique growth habit. Its minuscule stems during the dry season, lose almost all of their water and shrink, becoming almost completely dry and flattened on the rocks where it lives. Stem: Flattened disc-shaped, gray-green, usually up to 1.2 cm in diameter (rarely exceed the 2, but in cultivation grafted plants may attain a bigger size. Ribs: Bodies have no ribs or tubercles. Areoles: Spiralling bearing tufts of wool and no spines. Flower: Diurnal, white or pinkish (yellow) diurnal, 6-15 mm long and 5-7 mm diameter and self fertile. Flowering season: The main flowering season is from late spring to early summer. Seed: The seeds are minuscule (like dust), globose (less than 0.5 mm) with a large swelling of the upper funiculus thst is equal in size to the seed; this corky structure (strophiole ot aril) also occurs in other species of tribe Notocacteae that are believed to he closely related to Blossfeldia (I.e. Frailea). This species also has prominent trichomes (minuscule hairs) on seed coat, one per cell. The seeds represent a particular adaptation to ant dispersal. The ants which, having been lured by the aril, grasp the seeds on their hairy surface and carry them to their nests. Chromosome number: Blossfeldia appears to be exaploid. Remarks: The spelling is often cited as "Blossfeldia liliputana", but under the provisions of the International Code of Botanical Nomenclature this is an orthographic error to be corrected to "Blossfeldia liliputiana". Blossfeldia cyathiformis F.Ritter: Small spineles form with white-pink flowers. Blossfeldia fechseri Backeb. : has heads about twice the size of Blossfeldia liliputana. 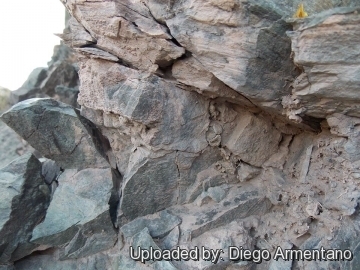 Distribution: Andalgala to Humahuaca, Sierra Ambato, Catamarca, Argentina. Blossfeldia liliputana Werderm. 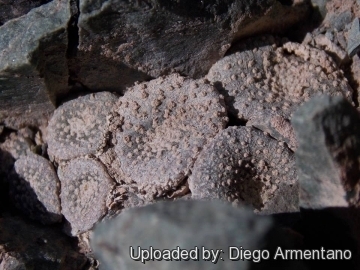 : This is the smallest known cactus, it forms forms little clusters of multiple disc-shaped heads that in nature rarely exceed 12 mm. Distribution: Southern Bolivia (Potosí Department) to north-western Argentina (Jujuy, Salta, and Catamarca Provinces). 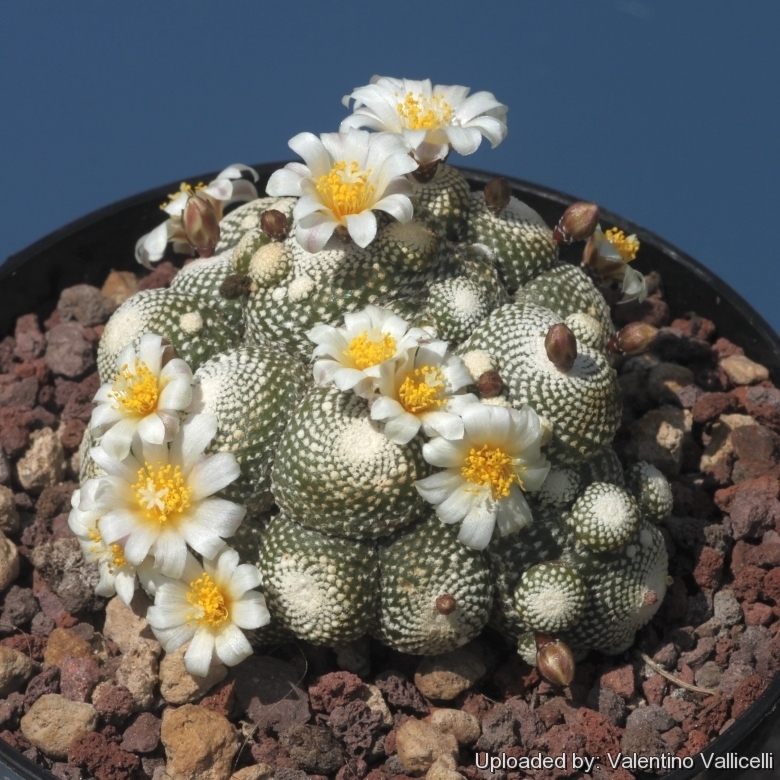 Notes: Bloosfeldia is a poikilohydric and almost astomate succulent: This remarkable miniature is the most enigmatic of all cacti, confounding us with its physiological, anatomical, morphological, ecological and evolutionary peculiarities. 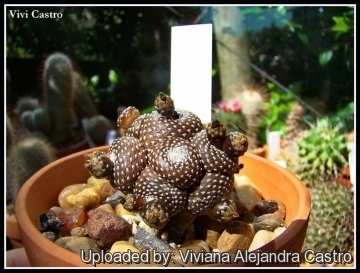 They are apparently the only cacti that are capable of completely drying out and then rehydrating their cells when watered (called "poikilohydric" or popularly "resurrection plants"). It has been found to lose up to 80% of its moisture in one year and then survive drought for an additional year, making it very similar to mosses and lichens in being adapted to withstand near complete loss of moisture! It could be that what looks like a few dried out and dead seedlings could be revived by a thorough soak. Except for certain parasites and aquatics, this species possesses the lowest density of stomata of any terrestrial flowering plant. 21) Leuenberger, B. E. & U. Eggli. 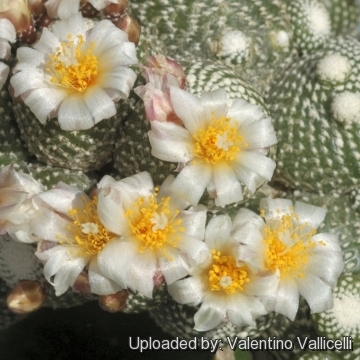 “Notes on the genus Blossfeldia (Cactaceae) in Argentina.” Haseltonia 6:2-13 1998. 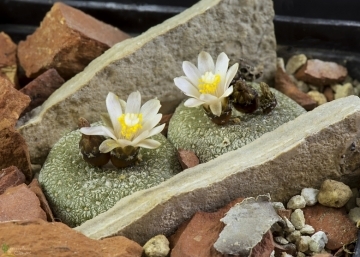 Cultivation and Propagation: The specialized environment of Blossfeldia liliputana (mountain rock cracks), and the extremely dry environment makes them very sensitive to root loss. Because of their slow growth rate, Blossfeldias are often grafted, which causes them to grow very fast and offset heavily but lose their characteristic disc-like shape, becoming quite globular and bloated. In this case the minimum temperatures acceptable should take in account the requirements for the rootstock. Any way this miniature is grown, it is a true wonder of the plant kingdom. Growth rate: Extremely slow growing unless grafted. Soil: Grow it in a particularly draining substratum, as it is very sensitive to rottenness when in presence of humidity and low temperatures and let the soil dry out between waterings. Repotting: Repot in the spring, when their roots become cramped. Generally, they should be repotted every 2-4 year in order to provide fresh soil. After repotting, do not water for a week or more. Use pot with good drainage. However, repotting doesn't necessarily mean they'll need larger containers. Fertilization: It grows faster with a low nitrogen content fertilizer in spring and summer. Watering: Water during the aestival growth cycle from March till October, the thin, fibrous roots suffer if there is humidity, therefore the plant should be watered only when the surrounding terrain is dry. But needs to be avoided wetting the bodies of these plants while they are in sunlight. A wet cactus in the sun light can cause sun burning which can lead to scares or even fungal infections and death. Keep dry as soon as the temperature starts dropping in October and keep it perfectly dry in winter at temperatures from 5 to 15 degrees centigrade. Preferable not to water on overcast days, humid days or cold winter days. Hardiness: They need to be kept in a cool place during winter rest and can tolerate sporadic frost if kept on the dry side prior to, and during, cold weather with little danger of being killed (Frost Tolerance: At least -10°C). However in cultivation it is better not to expose it to temperatures lower than 5° C, even if in an aerated and protected location. It tends to rot in winter during the resting phase, if kept wet. In the rest period no high atmospheric humidity!! Sun Exposure: Some shade with ample airflow is preferred for best appearance. Propagation: Almost exclusively by seed and graft. The minuscule seeds should be sown on the surface of a very finely sifted soil mix. These plants are very slow growing and is very difficult to keep them alive on their own roots for the first 4-6 months and should be watered by carefully misting with a hand held spray bottle until they are large enough to be watered normally (2 to 5 years!). But the bagging is the preferred sowing method for this plant, of course, maximum sterilization is important in that method as the bag remains sealed for up to two years. 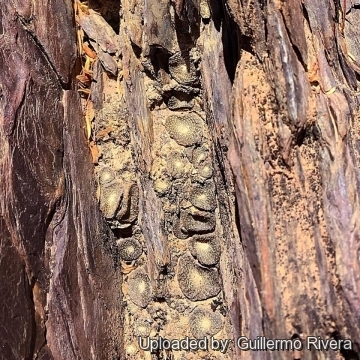 We have even heard of people successfully growing this plant on a porous rock. Many growers graft tiny 2-3 month seedlings and they grow on very successfully that way. There are a total of 22 Photos.